I did a talk a few weeks ago on different film portrayals of Dickens' "A Christmas Carol" and how they relate to the issue of poverty and the Christian message. I chose the reading of the rich man and Lazarus from Luke 16 as I have a hunch that it was somewhere in Charles Dickens’ mind when he wrote “A Christmas Carol”. Perhaps he wondered what would have happened if Abraham had been overruled? Certainly Dickens’ Yuletide yarn is eerily similar to today’s gospel reading. Both are parables about rich men and about the importance of how we treat those in need. Like Luke’s story Marley realises too late the dreadful error he has made, but in Dickens' novel Marley is allowed to warn his friend, Ebenezer Scrooge the peril he faces if he does not change his ways and seek “to interfere for good, in human matters” or to make “mankind his business”. "A Christmas Carol" is, in many ways, an extended parable. As someone who has been reviewing films for the last decade you get used to people talking about the movies as 21st century parables. There’s a lot of discussion about what parables actually are. But by taking a moral issue and forging it into drama, parables help us to examine the ins and outs of that issue in ways that can be fresh, challenging and surprising. They give us fresh perspective and help us grapple with questions that may have ceased to grab us. And this is an ongoing process. Some scholars believe that in telling this parable Jesus himself was putting a fresh spin on an even older story. Dickens in turn made those issues more contemporary for his audiences and for more than 110 years different film directors have sought to take Dickens’ work and cast it in a new light for the people of their own day. And ‘A Christmas Carol’ does seem to be particularly suitable to adapt. Of the 324 screen portrayals of Scrooge’s story on IMDB, at least 70 were based on ‘A Christmas Carol’, almost twice as many as adaptations of Oliver Twist and 3½ times as many as any of the others. Does I counted 7 playing on terrestrial TV over the Christmas period in the UK. The latest of which was made in 2009 starring Jim Carrey. It’s in 3D reflecting one of the ways this story adapts well to the fashions of its day. Go back a few years and you’ll find Patrick Stewart starring in a version rich in CGI. In 1928 at the advent of sound the first Dickens talkie was "A Christmas Carol" and if you go back to the very first version of this story, from 1901 you’ll see how it uses very primitive special effects which were starting to be discovered. The BFI have made this film freely available on YouTube, and it's worth remembering that the film was made over a century ago in 1901, far closer to the publication of the original novel than to today. The apparitions that fly past at around the 1m45s mark rely on people knowing the story, but essentially they show the events of the Christmases past that have shaped Scrooge. The first shows his return to his father’s house after years of spending Christmas at his decrepit school. His beloved sister welcomes him back. The second, with impressive economy shows the end of his relationship with Miss Fezziwick, who finds herself squeezed out by Scrooge’s pursuit of financial security. It’s not something that is talked about often, but I think these two scenes are pivotal in the story of Scrooge’s life. Why else does the ghost, or if you prefer Dickens, choose to show us them? The villain we meet at the start of the story was not ever so. He was a rejected child even spending Christmas day at school, and a poor school at that - Dickens describes the decrepit school and classrooms at some length and noting that there was "not too much to eat". These early events seem to have shaped Scrooge quite significantly. There’s sometimes a lot of talk about child poverty today in Britain. Government figures suggest that the number of children living in poverty is between 1 in 4 and 1 in 3. And such poverty doesn’t just have an effect on their past deprivation, or their present hunger, it affects their future health and shapes their attitude to life. They all too often believe that poverty is their lot in life, and lacking hope and aspiration settle for life at the bottom of the pile. No wonder the UK has one of the worst records on social mobility in the western world. Despite the occasional heart warming rags to riches story, the reality is that for the vast, vast majority, those who are born poor will, in all likelihood, remain that way. From here Scrooge is done for. Having grown up in isolation he has learned to cope with it and since the death of his sister also seems to have occurred around this time, he seems to have retreated into isolation once more consumed by a desire to avoid poverty. As he explains “there is nothing on which (the world) is so hard as poverty”. It’s not long before the next apparition - the Ghost of Christmas Present - is taking him to the household of his employee Bob Cratchitt. It’s arguably the most famous scene in a story crammed with iconic moments, but it relevance to Scrooge is easily over-looked. Firstly, here is a child also in poverty, but whose father has taken a different path to that of Scrooge’s father. Instead of sending him away, Tiny Tim is kept in the bosom of his loving family. 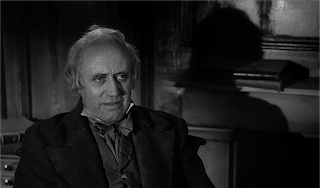 Secondly, Crachitt’s family live in poverty, but have found the happiness that so seems to have eluded Scrooge. Tim has flourished despite his apparent adversity. Thirdly, I suspect there’s something of a grudging admiration for the fact that Crachitt has never begged - Scrooge is amazed to find out about Crachitt’s sickly child. These, I think, are what underlie Scrooge’s turn around rather than simply Tim’s cute way of saying “God bless us every one”. Given the course of the rest of this story this line is pretty significant. Prior to the haunting of Scrooge, Tim is on course for an early death, but as Dickens tell us in closing the book, Scrooge’s repentance and intervention means that Tim lives to a good age. And so there’s an interesting implication that whilst Jesus has apparently not healed Tim directly, Scrooge has been able to be a vessel for God’s purposes. By using his money to make a difference to Tim’s life he has stepped into the role of healer. There are no longer any workhouses or debtors prisons, but teachers still regularly encounter kids without beds at home or that come to school hungry - I’ve had reports of that from a teacher I know who works at a nearby school just a couple of miles away. Yet some people today when faced with the plight of those living in poverty still resort to these same tactics - denying the problem, convincing themselves that paying their taxes absolves them of any further responsibility, or claim that they are all idle. It’s disturbing how many newspapers and politicians are content to peddle the myth that the poor are idle, despite the fact that more than half of all children living in poverty in this country are from working households. And whilst the phrase "surplus population" is more in line with Thomas Malthus than any of our current populations there does seem to be a shift away from seeing children are a gift from God towards them being a burden on the tax payer. The words Scrooge speaks here are repeated tauntingly by the Spirit of Christmas Present later on, as Scrooge’s heart begins to soften they remind him of how awful some of his attitudes have been. In fact it appears that Scrooge has been isolated from the realities of poverty in his own day. Faced with the image of the starving children "Ignorance" and "Want" he is horrified and gasps "have they no refuge or resource"? "If you deny him, slander those who tell others about him, admit he exists but do nothing about him." The reality is that in our country it is scarily easy to become isolated from those living below the poverty line. Listen to any public debate about poverty and someone will cite poor houses with satellite dishes - as if they have done a properly sampled survey on the issue rather than just noticed them on houses in areas they wouldn’t care to live as they drive hastily by. Scrooge’s about turn is radical, but the question that should haunt us is would it take such an extreme turn of events to soften our hearts to the very real suffering around us and amongst us? Poverty has a ghost of the past, and of the present, what are we prepared to do to ensure it has no future? Are we prepared to act at a cost to ourselves to alleviate the suffering around us? I don’t know whether Dives and Lazarus were any more real than Scrooge and Crachitt. But Jesus, Dickens and the filmmakers that have followed in their footsteps have acted from the conviction that it’s in this world that we have to address the problems of poverty in our world. We can’t leave it until after we’re dead. Absolutely Fabulous star and British national treasure Joanna Lumley headed out to Mount Ararat in an attempt to find Noah's boat in Sunday's ITV documentary The Search for Noah's Ark. Starting off in Tissington Derbyshire, before heading to Mount Ararat (in Turkey) via Istanbul. In Istanbul she "learns" that Noah is a celebrated figure in Islam as well as Christianity and Judaism: At Ararat she views the Arzap Drogue stone (rock anchor) and hears Ron Wyatt's theory that the Durupınar site is the final resting place of the Ark. Having spent time meeting the locals including those in the local museum, Lumley then meets a geologist who persuades her that the Durupınar site was simply formed by a standard geological process. Yet whilst Lumley is put off from her initial quest to find the ark she then decides to head to the region around Mount Judi - named in the Koran as the ark's resting place - to find if there is any evidence for the flood. She visits one of the places that claims to house Noah's remains and eventually wonders if the area flooded was actually considerably smaller than worldwide - perhaps the area between the Tigris and Euphrates. Lumley heads back to London next to meet with Rabbi Julia Neuberger who talks about the Noah traditions in Judaism and our lack of knowledge about the precise words used. "Was it a Raven?...sure about the names of the birds? I'm not sure". But instead of taking Neuberger's advice, Lumley goes to talk to a raven expert somewhere in the English countryside. Then it's time to meet Alan Millard in the British Museum who talks about the Gilgamesh epic and the Mesopotamian story that many suppose lies behind the story. After the break Lumley heads to India to uncover a Hindu version of the story even more ancient than Gilgamesh, that of Vishnu and King Manu. Having heard about the Indus region's 5000 year old trade with areas as far away as the Arabian peninsula, Lumley heads to Oman accompanied, briefly, by an audio clip of Eddie Izzard's Noah routine. When she arrives she talks to Eric Staples who enlightens her and us about the kind of wooden boats built in the time, but suggests that boats the size of the ark were unprecedented at that time and would have had to be miraculous. Finally Lumley meets geologist Mohammed Alkindi who finds evidence for some sort of catastrophic flood. Lumley sums up by saying that there probably is some kind of historical core to these stories, but one that has been adapted and transformed into a moral story, encouraging its audience to "be good". It's a rather simplified summary of the role the story plays and whilst, I suppose, I broadly agree with the programme's findings - some evidence of a localised catastrophic flood which got passed throughout the wider region - the summary seems rather undercooked. If such an event occurred the results would have been so catastrophic as to reverberate throughout the region for centuries rendering itself rife for the type of mythology we find in the Noah story. Not so much simply a prod to "be good", but a fear of the danger of the untameable natural world, the hope of a deity who can rule over it and the warning to stay on his right side to avoid similar catastrophe happening to oneself. The problem with the documentary, as is often the case with similar programmes is that the absolutely key information is often greatly abbreviated and given little more air time than the more trivial travel-journally type footage of, say, Lumley eating food in Istanbul and wondering if Noah had eaten a similar dish all that time ago. Lumley's opinion is apparently changed by what she hears, but the evidence which appears to persuade her is strangely absent. None of this is to say it's a bad programme - far from it, and given ITV's relative paucity of this kind of documentary it should be applauded for providing something rather more demanding than the X-factor and indeed giving it a fairly high profile. Lumley is a high profile TV star, and whilst clearly not an expert also refuses to revert to the cliché of feigning total ignorance about her chosen subject. At the same time as a non-expert she is able to take the audience with her. Secondly whilst I wish certain parts of the material could have had greater emphasis, not many aspects of the topic were entirely absent. More conservative believers might wish that more time had been given to Wyatt's theories and more literal interpretations of the Noah story, but in honesty there's not much that a documentary can really do with this kind of approach. So whilst not perfect, The Search for Noah's Ark is a fairly good attempt to grapple with the wide variety of specialisms that shed light on the story of Noah which is hopefully sea worthy enough to encourage ITV to be involved in similar projects in the future. N.B. Richard Bartholomew has also posted a review of the programme. Heavenly Holiday Film Classics is a collection of six lesser known Christmas films from days gone past. The majority go back to the fifties and sixties but at least one has their roots even further back. As a result these films are hard to get hold of and Festival Films has done a great service by collecting them and making them more widely available. But make no mistake, the films have not been digitally remastered or restored and Festival Films make no such claim. The film itself is simply, but effectively made. Black silhouetted characters move in the foreground contrasting starkly with the film's coloured backgrounds. The simplicity of the medium should not be mistaken for a lack of sophistication however. The graceful, skillful movements are capable of evoking genuine feeling, the birth scene, for example, evokes surprising intimacy. The one notable change in style is the appearance of the angels to the shepherds. In contrast to the rest of the film, he its the angels who light up against a dark background. The story is straight forwardly told, and whilst the medium and voiceover are both a little dated, younger children will still enjoy it. My 4 year old and 6 year old did at any rate. Perhaps the best of the six films on offer here is Three Young Kings by director Richard Kinon. Kings tells the tale of three boys from the mission school who have the honour of playing the wise men in the village's traditional present-giving ritual. Parents provide presents for their children via the school and the eldest three children don magi costumes and go round the richer parts of town dishing round their gifts. But this year the trio take a short cut through the poorest part of the village and end up giving the presents away to those children instead - most of whom will not get presents. The pivotal scene is a delight with the three boys switching from mild annoyance at being inconvenienced to handing round other children's presents with gleeful abandon, but it's the final scene with echoes of the still-to-be-made Spartacus and 12 Angry Men in the mix that clinches it. The boy's main opponent is possibly a little too cartoon-like for my liking, but that fails to rob the story of it's genuine emotional wallop that makes it the film of all these likely to become a stable (sic.) of Christmas viewing in the Page household for years to come. 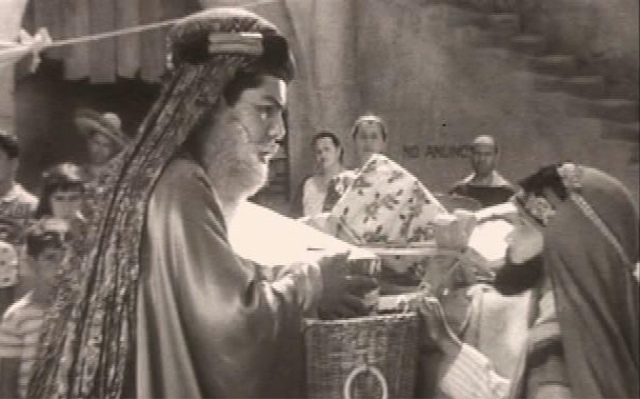 Star of Bethlehem (1954) was a pet project of actor James Mason who produced, directed and narrated the film and cast his own daughter as Mary. It's an funny old project. The first half of the film consists of Mason dully narrating the nativity account from Luke. It's not helped by the use of a (now) fairly archaic translation, but Mason's famous voice is renders the story dull by its lack of intonation. The second half however is very different, a charming adaptation of the story using children. Child actors can be a real hit-or-miss affair but these children do a decent job of playing their roles without swinging to far into honey-coated sentimentality. I'm not sure my kids would sit through the first half of this film again, but they would certainly re-watch the second part. The second "Silent Night" origins storyline the collection is actually the elder filmed in pre-war Austria in 1939. The timing of the film would have made it strongly political as it draws out parallels between Napolean's forced conscription in 1811 and similar events in the austria of their time, but its focus is more on the need for reconciliation once the conflict is over. These debates are focussed in on a single estranged family - a man who having lost his son in the hostilities can't forgive his daughter for marrying a survivor, not least because he is also the son of a survivor from a previous forced conscription. Even the birth of a grandson fails to melt the old man's heart. What is melting however is the snow above the young couple's house in the mountains, leaving the three of them homeless the night before Christmas. Finding the family bedding down in a nativity-esque stable Father Mohr decides to take action, writing a song to accompany his homily on the scandal of unforgiveness and estrangement and when he teams u with Franz Gruber the world's most well loved Christmas Carol is born, leaving the old man defenceless to his grandson's advances. At times it's a little forced, but, I must admit, I'm a sucker for stories of reconciliation and, not for the first time whilst watching this collection of films, the odd tear might have been shed. All in all then an interesting mix of films with different degrees of quality effectiveness, emotion and religious content and for the completists, or those keen for a bit of nostalgic content this would make a great addition to your Christmas film collection.